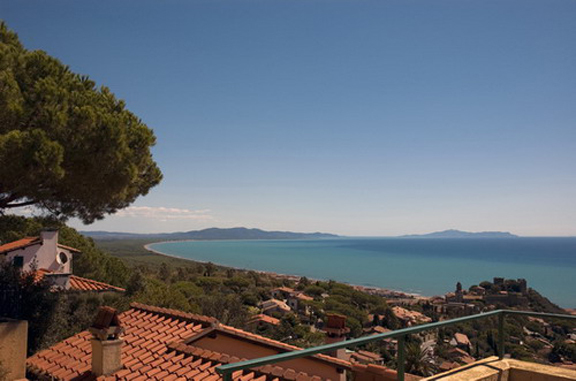 Above: Castiglione della Pescaia is one of Tuscany’s best-kept secrets. Click here for the Google map to see where it’s located on the Tuscan coastline. Now that summer’s around the corner, we know that a lot of you are planning your summer vacation in Italy. Many of you beach-lovers will head to the glitzy Amalfi coast or to the swank beaches of the Lido in Venice. But Mazzoni winemaker Alessandro Bindocci will be spending his summer vacation (in August) in Castiglione della Pescaia in Tuscany, a roughly one and a half hour drive (depending on how fast you drive) from his home in Sant’Angelo in Colle where Mazzoni wines are made. Castiglione has all the amenities of Italy’s more famous beaches. There are camping spots, beaches with cabana/umbrella services, and some of the most famous seafood restaurants in Italy, mostly on the economical side. But the best part is that the village of Castiglione della Pescaia — which translates loosely as “the fisherman’s castle” — is a wonderful hilltop medieval hamlet. It’s a great place to get lost in its winding little streets, to have a coffee at a café with the local folks, or just to relax with one of the greatest views of the Mediterranean (the Tyrrhenian Sea). And from Castiglione, you’re only a short drive from Montalcino where they make Brunello di Montalcino (and Mazzoni wines), an even shorter drive from Bolgheri wine country, and there are also a number of interesting historical and archeological sites in the area as well, including many Etruscan excavations and museums, like the Museo Archeologico e d’Arte della Maremma. This entry was posted on May 28, 2014 by Terlato Media. It was filed under LIVE LIKE AN ITALIAN . Maxine, thanks so much for your comment! We’ll be posting on more interesting beach spots as summer draws nearer! thanks! 🙂 happy travels!